Read more details about Portsmouth Abbey School on their 2018-19 profile page. Activities During Boarding School Sailing, Cross Country, Soccer, Soccer Manager, Conditioning, Varsity Sailing Captain, Student Council, Dorm Representative, Head Girl, Open House ambassador, Red Key Tour Guide, Student Newspaper, Art Club, Students Against Destructive Decisions, Peer Tutor, Prefect, Volunteer Service Trip to Lourdes France, Pilgrimage to Rome. At Portsmouth Abbey School, the community is so engrained with basic Benedictine values that are so evident in the vibe of the campus. When yo was around everyone says hi to each other and is so friendly, and the monks are always around to chat or sit with you in the Dining Hall. It is the most incredible part of the Abbey to have the religious aspect so well integrated into everyday life in a way the incorporates all students. I was so shy when I left for the Abbey, and by my senior year I was Head Girl and a prefect and incredibly involved. I got to grow as a person and was given so many opportunities that I could not have gotten anywhere else. Being Head Girl was such a honor and privilege and I will always look at that as one of my favorite parts of going to the Abbey. I learned a lot about what it takes to be a leader and how to handle tough situations. I also learned a lot about how talk to all sorts of people because we have so many different types of people. I wish I had worked harder my first year. I did not focus on my school work until my second year and didn't start making relationships with my teachers until sophomore year. It's never too early to get started and get involved. I can't pick just one thing. The Abbey was such a blessing for me in every way. I made incredible friends, learned so much, and had so many opportunities. The Abbey is such a great place to succeed but like anywhere, its what you make it. St. Benets is my favorite dorm on Campus. I lived there for 3 years and some of my favorite memories are late at night in the dorm with the houseparents and some fellow dorm-mates talking about our lives and laughing together. At The Abbey the teachers want you to succeed more than anything, but that doesn't mean they won't challenge you and push you to do you best. They demand excellence and when you are held to such a high standard, it motivates you to succeed. Teachers are also always available to meet with you and work with you outside of the classroom. One of my favorite memories from the Abbey was meeting with teachers during study hall and having a relationship with them where I felt like I could really talk to them when I needed something. You will be challenged but the support is there is you just ask for it. The Athletics at The Abbey are so much fun. Although three seasons are mandatory to participate in, there are so many options for everyone that you are bound to find something you love. They also offer music and theatre options in lieu of a sport. However, sportsmanship is more important than anything else to the teams and everyone supports one another. It was also really cool to watch students as freshman come in never having played a sport and rise from JV to Varsity Captain- like myself- in sailing. I did not participate in the music or theatre program but was very involved in the visual arts. I participated in art club for three years and took 3 art classes throughout my time at The Abbey. The art teachers allow you to experiment and try things out and do whatever they can to support your creativity and ideas and also collaborate with you to achieve something incredible. The Art program was so good for me and by my senior year I earned 4 art awards in photography, and one was even on the National Level! There is such a myriad of extracurriculars available that there truly is something for everyone, and if there is something you want that isn't there, you can create a club. While I was at the Abbey I saw so many clubs go from the idea stage to being really popular clubs that kids loved. Because our school is really small, the dorm life is so special. You get to know everyone in your dorm and by sophomore year, you could be living with people in three different grades. It really integrates the school and allows you to meet kids in different grades and activities than you. Every dorm has prefects and house parents who are there to support you 24/7. I had such a close relationship with my house parents and prefects and they were there for me anytime I needed extra support. The dorms are so much fun and each one is really unique. There is a lot of dorm pride on campus which becomes really exciting during the Raven Cup events which are competitions between the dorms. Now, being at college, I appreciate the Abbey food a lot more. The dining hall staff were so nice and always tried to make things that the students would like. It wasn't always perfect, but they always had consistent options like soup and salad, and made a good variety of entrees. Newport is such a beautiful city only a 15 minute drive from campus. Portsmouth also has tons of places to eat out or order in. The Abbey kept us pretty busy though so I never felt the need to leave campus too much. There were never 'cliques' at the Abbey. You had some variety athletes who were also the lead in the school play, and some incredible artists who also participated in student council and had an A+ in math. The make-up of the school is so unique and there is a place for everyone. My favorite aspect of the social makeup is going into the dining hall and no matter what you can sit at any table and have an awesome conversation. 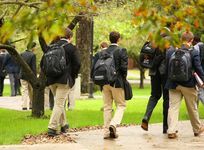 At Portsmouth Abbey School, the community is so engrained with basic Benedictine values that are so evident in the vibe of the campus. When yo was around everyone says hi to each other and is. . .
One thing that makes us unique from other schools is our religious aspect. We were founded by a Benedictine Catholic monastery that still is active, and it influences campus life. We have mass every Sunday. . .
Portsmouth Abbey is located right alongside Narragansett Bay. The location sets it apart from any other schools because of all the unique opportunities of a bayside campus. On any given warm spring or fall day. . .